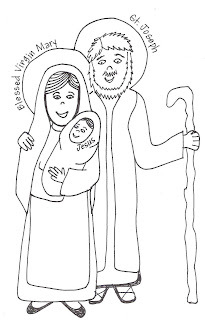 We also included the Holy Family. This one is my favorite. It is at the very end of the hallway on the facing wall, which means Jesus, Mary, and Joseph look over the whole program. (However, I should admit that if you choose to paint life sized murals, you have to accept that when you are there alone, and you may or may not be working with all of the normal lights on, it is highly likely that out of the corner of your eye you will think that someone is actually standing there. Anyways, we love them, and the kids love them, and they help us call to mind the holy people who came in faith before us. I used sketches to get started with the paintings, and instead of just throwing them away, I turned them into coloring pages. Here is the first installment, the Holy Family. Click below for the printable.